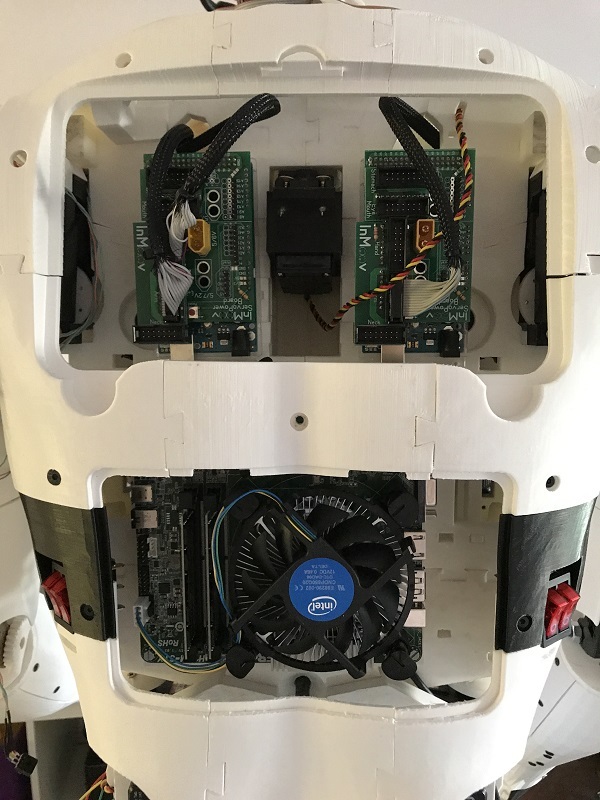 The plan is to run the microATX board directly off of 2-4 10 wH batteries and provide the regulated 5 volts through the board's USB ports for small stuff, and using an automobile DC to USB converter for regulated, high-amperage 5V. As of right now I'm not using a graphics card because the Arduinos are sitting on top of the PCIe lanes, so instead I'm using a Movidius neural compute stick on USB 3.0, with additional processing offloaded to an off-board compute cluster (built from junk). My queston is, is it okay to have the Arduinos sitting there? I have a 3D printed riser board that they're connected to so nothing is contacting metal-to-metal, just wondering if I should worry about heat/interference, anything like that. One last thing: I don't think the back cover is going to fit now, but I thought I've heard of someone else using a microATX board. Just wondering if there's like any modifications I should make to the back supports. Submitted by GroG on Sun, 01/20/2019 - 10:15. It was my plan to do the same. I have an Intel Atom microATX and an automobile DC-to-DC converter. The problem I had was with the dc converter - I believe it was faulty to begin with (The Atom still works fine). In this setup I don't think you need to worry about heat or interference. The source of the most interference is usually Motors/Servos which generate huge spikes and noise when running and the second most interference is often the 60/50 AC power hum. The computer board itself generates very little noise, as its one of the things which would be most likely affected by it. If you have interference problems - look to the motors and undercurrent first. Heat will build up in closed containers, but if you vent sufficiently you should be ok, certainly vent+fan is even better and vent+fan+heat sensor is more effecient. Submitted by hairygael on Mon, 01/21/2019 - 12:40. 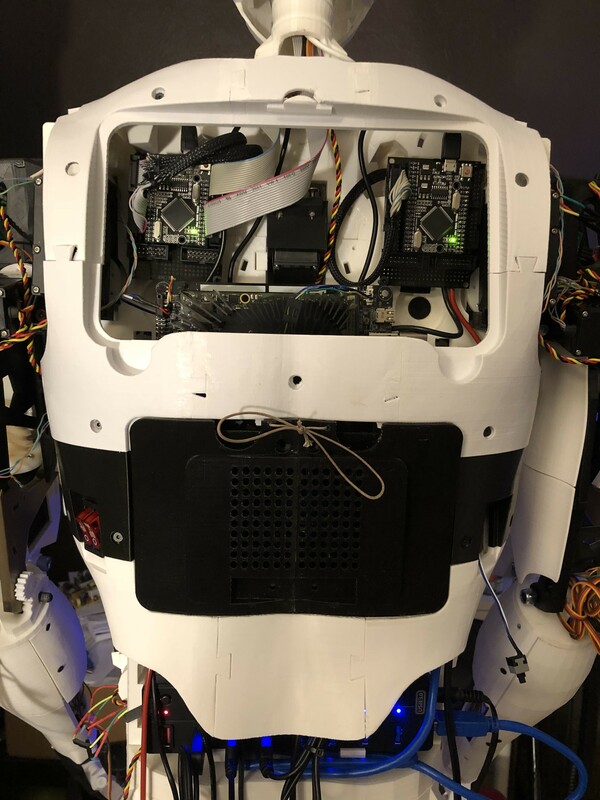 I have never seen an InMoov with such a huge board on his back! Do you want to use this board because you already have it, or did you buy it specially for the robot? I love it when old PC gets re-used for mad projects. What is the processor? and RAM? I recently bought a small i7 NUC for my InMoov, and the motherboard can be set where ever you want because of it's small size. 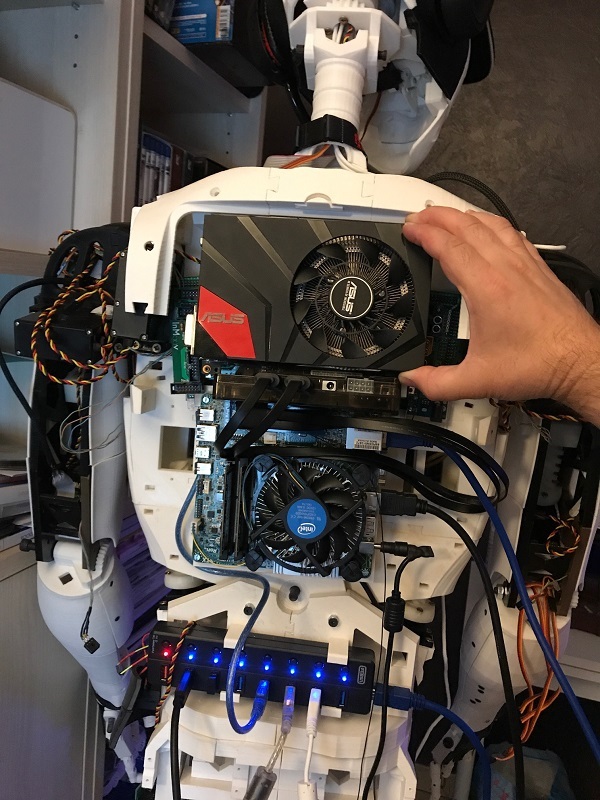 Of course it has no PCI slot for a graphic card, but the integrated graphic card can handle pretty well what InMoov does. Submitted by Bretzel_59 on Mon, 01/21/2019 - 14:56. WoW that's a huge mother board :D I didn't think it was possible to put this on his back. If you want to install back cover, I think you should rather use another board format such as mini ITX, Thin mini ITX, or smaller like Mini STX mother board. With ITX, you can have one PCIE x16. With Mini STX it is possible to have a PCIE 3 x4 M.2 port and use a M.2 to PCIE x16 adapter. Submitted by AutonomicPerfec... on Mon, 01/21/2019 - 16:20. I have a mini ITX actually, only issue is it was made when I was 3, it's so old the Linux kernel doesn't properly support it anymore. I'm using the micro ATX because i was free (liquidation of local company) and it's the most powerful one I have (which isn't saying much). I also have a pi in the head and am planning on sticking a laptop to his back. Why so many you ask? I've been doing experiments with OpenCL and ROS, and what I've been seeing is that for sufficient performance I need a cluster, and I don't want to have to rely on the off board cluster too much. 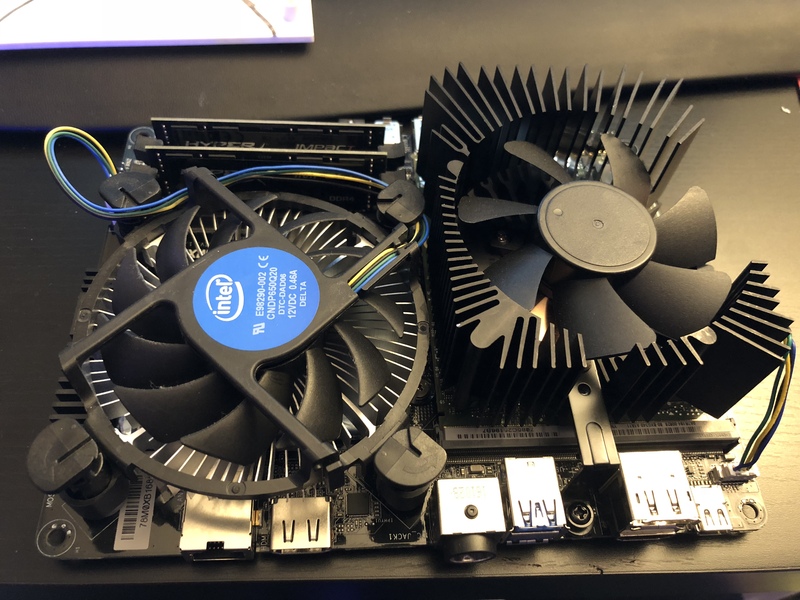 My board has one x16 PCIe slot, and my riser board was designed to leave enough room for an extension cable in case I every do get a graphics card. For now, I'm using a Movidius NCS and am getting around 15FPS for YOLO over a USB webcam (technically a pi zero masquerading as a webcam), so it's good enough for now. Submitted by AutonomicPerfec... on Mon, 01/21/2019 - 16:31. Submitted by spukemonkey on Wed, 01/30/2019 - 11:10.